Urban farming and community gardening have been time-tested in San Francisco. 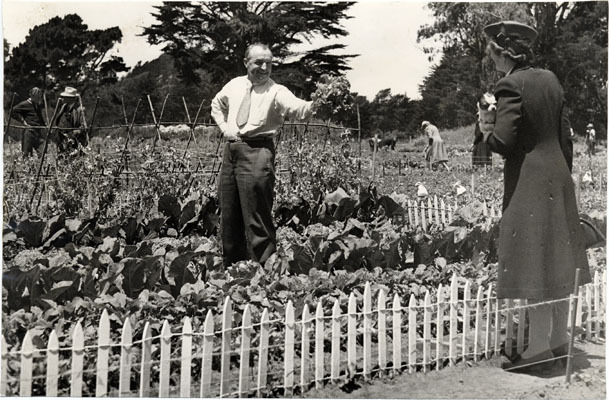 Few people today realize that Golden Gate Park was a productive urban farm during World War II. ‘Victory Gardens, also called “war gardens” or “food gardens for defense”, were gardens planted both at private residences and on public land during World War I and World War II to reduce the pressure on the public food supply brought on by the war effort. In addition to indirectly aiding the war effort these gardens were also considered a civil “morale booster” — in that gardeners could feel empowered by their contribution of labor and rewarded by the produce grown. These gardens produced up to 41 percent of all the vegetable produce that was consumed in the nation. via ~ Victory Gardens History ~. This entry was posted in "lost" golden gate park, eating, health and safety, history, plants and tagged community gardens, foraging in public parks, golden gate park, golden gate park history, lost golden gate park, urban farming, urban food systems, urban parks, victory gardens. Bookmark the permalink. I am happy to find your blog! has been quite slow in responding to my inquires. and especially photos , which are rare to come by for me. I met his wife, Vivian , unfortunately 2 weeks before she died. She told of his great love for the park and the 1939 Fair on treasure island. so it was a special moment just to see my great aunt regardless. Any help is most appreciated, and definitely mentioned in the book.